Scopri la bellezza costiera della Repubblica Dominicana in questo viaggio di un'intera giornata all'isola di Catalina con la crociera in catamarano di Chavon River. Godrai di bevande a flusso libero mentre ti fai strada lungo alcune delle coste più epiche e incontaminate della nazione. Saranno tempo per esplorare i boschi tropicali a La Minitas Beach e fare snorkeling nella famosa destinazione conosciuta come "The Wall". Un pranzo a buffet e un viaggio di andata e ritorno in hotel sono inclusi in questo tour che mette in mostra il meglio del paradiso! 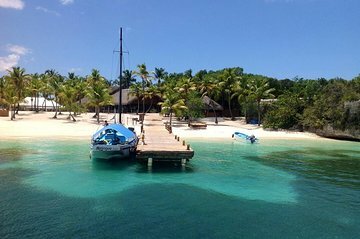 Dopo aver incontrato il tuo autista e guida al tuo hotel, dirigiti a La Romana, dove prende il via questa Catalina Island e Chavon River Catamaran Cruise di Punta Cana. Salite a bordo della vostra nave e dirigetevi nelle acque cristalline dei Caraibi mentre sorseggiate cocktail illimitati, ascoltate musica e godetevi il sole. Attraverserai la spiaggia di La Minitas, riconosciuta come uno dei tratti di sabbia più esclusivi dell'isola. Navigherai verso nord verso la foce del fiume Chavon e passerai accanto a ville di lusso, campi da golf e giungla tropicale. La tua guida indicherà gli uccelli colorati e la fauna locale mentre ti fai strada attraverso questo incredibile paesaggio. Successivamente, tornerai al Mar dei Caraibi verso il Catalina Island National Park. Trascorri 45 minuti facendo snorkeling a "The Wall", una famosa zona di barriera corallina conosciuta per pesci tropicali, coralli colorati e incredibili paesaggi sottomarini. Finalmente arriverai a Catalina Island dove avrai il pomeriggio da trascorrere a tuo piacimento. Nuota, fai snorkeling, rilassati, dipende da te! Goditi gli oggetti del pranzo a buffet con barbecue ogni volta che ti viene voglia di fame, e ritorna al porto di La Romana e al tuo hotel a Punta Cana quando finalmente questo giorno nel paradiso tropicale finisce. Bonita isla con preciosa playa en el norte ! Had a great day. Ocean at the island was beautiful. Food was good, people nice. Went with a group of friends, everything was what was published, with so much fun added. Would do it again in a second. Because of your error, we were not able to go on this trip. We booked in advance, but the local tour company had no record of our booking and they were full, so we didn't go. I will never use Viator for anything ever again. I now understand why one of the reviews said they 'didn't get this tour'. We called the third party pick up company and after quite a bit of discussion, finally arranged our pickup from our hotel. However, from there forward, there was utter confusion on their part. They had no idea where to bring us to get on the tour. Ridiculous since they were hired to bring us to this tour and had our booking confirmation information, which should have assured proper coordination. They drove for 10 minutes, parked along the highway, spoke on the phone, turned around, drove back 15 minutes, parked again, spoke on the phone, turned a different direction, drove and parked and then told us to get on a bus that had pulled over. We found out that they had simply been trying to find any tour bus with an opening that was on it's way to Catalina Island. This was NOT the tour we paid for. The part of the tour we were MOST interested in was the cruise down the Chavon River and we did not even get to do this! We searched and searched for a tour with this cruise and even paid 20 extra dollars to get the river cruise. Very, very disappointed in the coordination of getting their clients on the CORRECT cruise. Viator needs to do a much better job of telling the company they hire to pick up their clients where to bring them. In fact, put that information on the voucher, in Spanish, so the people who are still confused know where to bring you. The third party tour company we found ourselves with, Scuba Quatics, did a nice tour i just wish that was the tour we had intended to go on. So if you want the Catalina Island Catamaran Cruise, ask for Scuba Quatics. The tour was awesome. Catalina Island is the bomb! I recommend if you are in Cap Cana you call first to see what days they schedule to come pick you up. They had to reschedule to pick me us up but they made it happen. We didn't get this tour, we ended up on the catamaran to Catalina Island snorkel experience not the tour up the chavon river. The trip we did was very good but we paid £135.28 for a tour which only cost £118.22.